Malak Bistro is located in of Santiago de Compostela, five minutes away from the Cathedral. It’s a meeting point for exotic food lovers, where you can discover the most exotic flavours of the Middle Eastern gastronomy and the vegetarian, vegan and traditional touch of the Spanish gastronomy. A restaurant where you can taste the diverse food culture from countries like: Palestine, Jordan, Lebanon, Syria and Saudi Arabia. Vegetarians, vegans and gluten intolerants, can find in our menus many options that will satisfy their needs. This makes Malak Bistro a reference inside our gastronomical scenario. 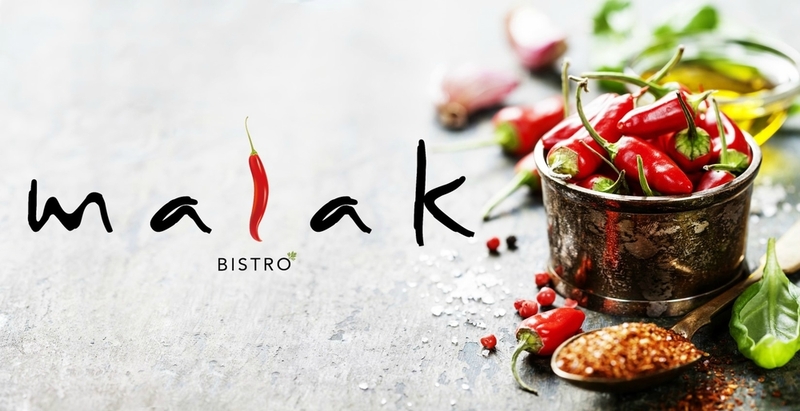 Located in the Galician capital, Malak Bistro is a meeting point for the pilgrims that come to Santiago de Compostela and want to taste the Exotic Vegetarian Vegan flavours. The clients can enjoy typical dishes of the International gastronomy, cooked with Premium quality ingredients from Galician origins. In Malak Bistro, the vegetarian and vegan food merges with Middle Eastern flavours, creating traditional recipes from countries like: Palestine, Jordan, Lebanon, Syria and Saudi Arabia. In our menus you can find a variety of dishes like the traditional falafel, the popular hummus, mix spice rice flavor, tofu skewers, kabab, curry, and even grilled vegetables. In our kitchen we use spices like: cumin, cinnamon, black pepper, parsley, turmeric, curry or thyme. We prepare middle eastern recipes, most of them cooked with vegetables, chickpea, rice, meat or couscous. Very close to our restaurant, you will find many of the most important sites of the city. Click on the icons and on the following links to discover the main locations that surround Malak Bistro. Thank you! We will confirm your reservation as soon as possible. malakbistro@gmail.com or +34 986 57 46 79. "Today is a perfect day to start living your dreams"